There it is, across a crowded room — tall, handsome, well built — it's love at first sight. We all remember the first time that we fell in love with an antique. At first, it's bliss — but then come the doubts. Is it, perhaps, a little too old? What if your other furniture doesn't like it? Some Alaskan antiques experts offer reassurance. Go ahead and take the plunge. After all, your new love seems so much, well, wiser than your other furniture. It has so much more to say for itself. But like any relationship, it requires commitment. First of all, don't sequester your new (old) friend. You're decorating your home, not a Merchant-Ivory movie set. 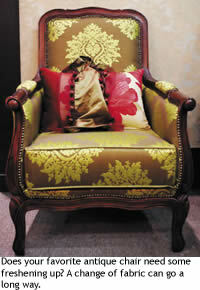 "In my own home, I commonly put old next to new," says Bridget Sanders of Mélange European Décor. "It helps give new pieces a little more character and can bolster a slightly boring piece," she says. "The rule is there are no rules." And while you have to decide what works for your home, Bridget will tell you what doesn't: a room that's too "matchy – matchy." "People still think they have to have everything oak or cherry or Queen Ann," she says. "That's definitely not the case." If you're not sure you have the confidence to step outside the (all oak) box, Karen Peterson of Karen Peterson Interiors offers some advice. "Heirloom pieces can be a challenge," she admits. "You have to find balance and proportion." Not only do furniture styles change from era to era, but so too does its size and heft. Marrying these different proportions is important, she says. A delicate Victorian occasional table might look silly next to the huge sectional that was custom made for your great room. On the other hand, a large solid piece of wood furniture might overpower a modestly proportioned room, she says. So, re-think that armoire (as she recently advised a client to do). 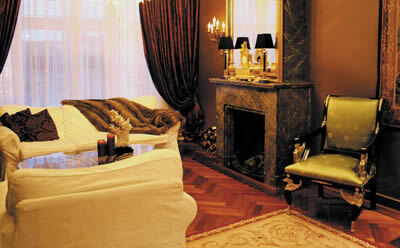 Get it out of your bedroom and into the high-ceilinged living room that is calling out for furniture with substance. "Decorating with antiques can take a lot of time and creativity and vision," says Nancy Hughes of Ozarks Americana, explaining why some people are reluctant to venture into history. "People are so busy," she says. "They may not take the time to consider creative ways to use antiques." She recommends treating yourself to a meeting with your inner-interior designer. "Drink a cup of coffee quietly and look around the room," she says. Then, listen to your thoughts. "You might think, 'I need something in this corner… maybe an old mirror…'" she says. You'll be surprised at what you'll come up with. In human relationships, it's common knowledge that you shouldn't try to change another person. Luckily, with furniture, that axiom doesn't apply. If your favorite antique is sticking out in a room, not standing out as it should, "Get past the look and see what it could be," says Nancy. "Paint it, restore the finish, buy some fabric and reupholster it," she says. "It just takes a little imagination." Karen agrees that a little change of fabric can go a long way. When a customer's grandmother's settee refused to fit into a "very contemporary home," she helped them find a bold and modern fabric that changed the look, and even the "visual weight" of the piece and gave a piece with sentimental value actual aesthetic value. So if your settee is asking: "Does this floral make me look fat?" go ahead and say yes. You'll be so glad you did. And while you'd never say it to your human loved one, sometimes old things do need a facelift. While you don't want to alter or refinish a truly priceless or pristine antique, many less valuable pieces can find new life in the simplest way. "It's quite proper today to take antiques and actually paint them," says Duane Hill of Duane's Antique Market. "I don't have a problem with it. You're buying something to use and enjoy in your home. If you want it to be green, let it be green." 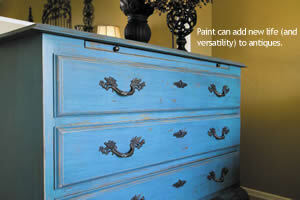 Painted furniture can be very versatile, says Bridget. "It doesn't have to create a country-folk-art look," she says. "Take a distressed piece, paint it black, and gilt the edges," she suggests. "And you can bring back a little of its original grandeur in a really cheap way." Now that you've made one relationship work, it's easy to be tempted by other handsome finds. But be careful, say all our experts: Once you let your guard down, it's easy to go overboard. Says Karen, "There are so many beautiful things out there – mirrors, clocks, and you have to be careful that it doesn't get to be too much." If you're not selective, she says, it's easy to "junk it up." Bridget advises placing "one strong piece in each room." That way, she says, "It can take center stage and not compete with other pieces." Nancy agrees, "You don't want antiques stacked up one on top of the other," she says. That's why Ozarks is artfully set up like an actual home. "People can see how well one piece can play off another," she says. Then they can bring this imaginative thinking home with them. Sometimes relationships end. And it's no one's fault. Not yours. Not the end-table's. Sometimes it's simply time to move on. But the end doesn't have to be painful. And you don't have to feel guilt for having a roving eye. If you're not happy with a piece, "pass it on to someone who can use it," says Nancy. "There's nothing at all wrong with getting rid of things you've had for years." Then, she says, "get something else that you feel more excited about." When it comes to antique brass beds, it's OK to sleep around.